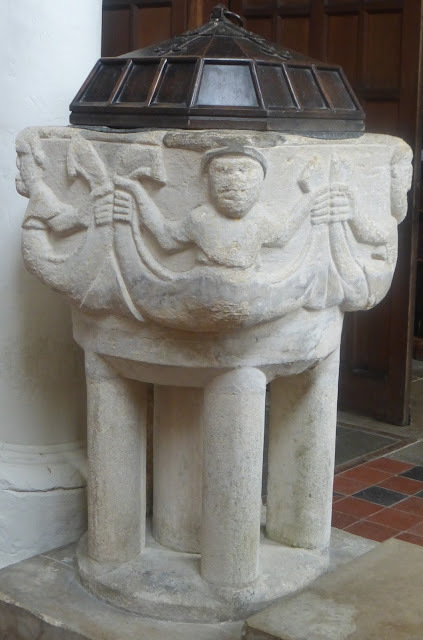 Last week I was preparing a post about Anstey church, and decided it would be a good idea to pay a visit to St Peter's, Cambridge (where I'd often been before) to compare its mermen font to Anstey's example. The church is immediately next to Kettle's Yard gallery, which has recently reopened after a lengthy refit. The design of the two bowls is very similar (the pedestals are different, but both may be later additions*), and either one is a copy of the other, (or of other, now lost, mermen fonts), or, more likely, they were both carved by the same sculptor. Both feature mermen at the four corners who hold one strand of their twin tails in each hand. Anstey's font pays more attention to the hands, while St Peter's lavishes more care on the tails, which end in forks, or, on the east face, divide into five - you might call them finny finials. It also has cable moulding around the rim, while Anstey’s font has an unadorned top. Both have been broken into several pieces and mended, most notably in St Peter’s on the south east corner: the repair and the different coloured stone are plainly visible. Damage to, or even destruction of, fonts is most often associated with the Civil War, and especially the Ordinance of 1645 which effectively banished fonts (basins were to be used instead). But we can't know if that was when St Peter's font was broken. It's hard to date the repair; none of the authorities I've consulted even try. Of course, the sculptor of the repairs was working not in his own style, but was trying to imitate the original style of the figures, which makes dating them more than usually difficult. Neither of the two old images of the font that I've been able to find are of much help in deciding when the repair was made. (The other can be found by clicking a link in a footnote below.) The one above dates from 1812 and is an engraving from James Storer and John Grieg's Ancient Reliques. (Their books, including The Antiquarian Itinerary and The Antiquarian and Topographical Cabinet, are almost like early 19th century Pevsners.) It shows the font standing, improbably, immediately inside the door, with a Regency buck leaning louchely on the jamb, looking as if he's eyeing up the mermen with lascivious intent. The engraving gives a good general impression of the font, but doesn't provide enough detail to see if the repairs were in place by 1812. The text accompanying the engraving says that 'At each corner of the Font are figures, in some respects representing mermen or mermaids, each having two tails; they are encircled round the loins, with an ornamental belt, and with hands, each embracing one of the tails.' It also claims that 'This very curious relic of antiquity had not, previously to the present annexed Plate, been introduced to the notice of the antiquarian world, neither has any attention been paid to it by historians of Cambridge, with whose writings the Editors and Proprietors of the Ancient Reliques are acquainted.' This is very likely true; two hundred years ago the systematic study of medieval art was still in its infancy. Mermen, however, aren’t so common. In European folklore they generally aren’t presented as being any more auspicious than their womenfolk, often getting the blame for storms, for example. And mermen on fonts are rarer still. Apart from St Peter’s and Anstey, the only other merperson on a font that I’m aware of is to be found in Braybrooke church, Northants. The figure here is sometimes interpreted as being a merman, but looks to me like a mermaid; it’s of about the same date as Anstey and St Peter’s, but otherwise has little in common with them. So why were the fonts decorated with mermen? Unfortunately, this is something we’ll never know. I can hazard two guesses: that the sculptor had taken a whimsical fancy to these figures from folklore as purely decorative devices. This seems unlikely, given the central importance of baptism; would he have been given such licence in such a prominent place in the church? Or that the mermen represent the evils from which the child being baptised would be protected by becoming a member of the Church. This would be a more convincing explanation if there were more fonts bearing symbols of sin or evil. At first when I entered the church I was focused entirely on the font, but I gradually allowed the baskets to impinge on my concentration, and the more I looked at them the more I was charmed and lulled. The effect is encradling, womb-like and comforting, making the small church even smaller, but also the baskets are star-like and reminiscent of the vast night sky, making it infinitely large. The baskets are soothingly repetitive, yet, being handmade, there must be tiny differences between them. I loved it, even though it gets in the way of the font a little. It will remain in the church until April 29th. The font, fortunately, will stay there for as long as our civilisation lasts. 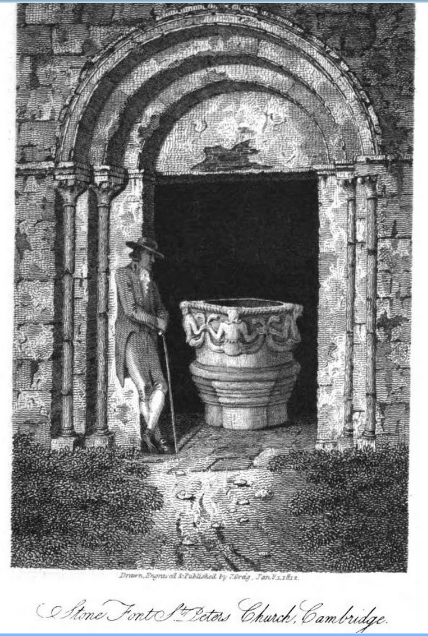 * See here for a drawing of St Peter's font dated 1858, showing a different pedestal. ** The Royal Commission on Historical Monuments (1959) calls them 'tritons', which, given that the the makers and original users of the font probably knew very little about classical mythology, seems inappropriate. *** But on the other hand, mermaids were in the later middle ages sometimes used as symbols of Christ, as their dual natures - part woman, part fish - was said to be like Christ - part man, part God.